We moved a few miles North to Cephalonia so that our angle on the wind would be better the following day. After a restful night we set off in the early morning. The beaches were still deserted. On our way across the Ionian sea. 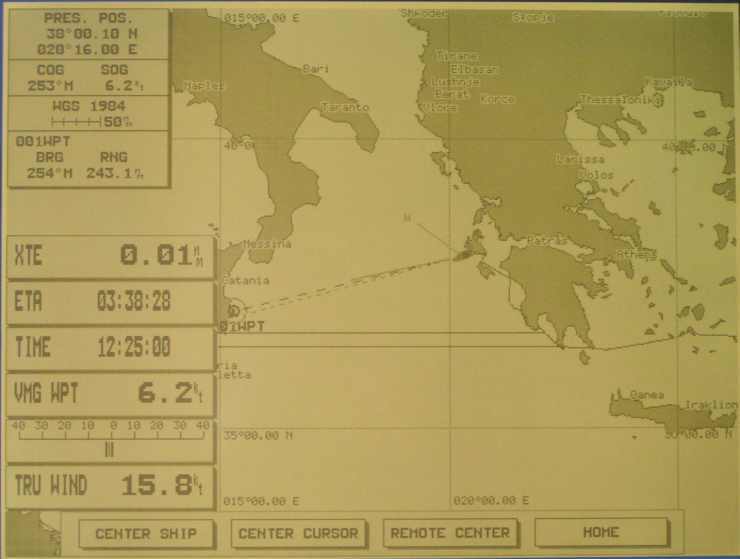 I took this picture of the chartplotter on 9 August. This is the info we have at our fingertips while underway. The "W" vector on the nose of the boat shows the true wind angle. The ETA was for 39 hours later at 03h38. Unfortunately the wind soon died and we had a leisurely sail all the way to Siracusa, stopping to swim, play, fish etc. We spotted turtles and saw the "Queen Mary II" come past at 27.2 knots with a 3m wake. We measured the underwater visibility to 70m by suspending a fishing lure until we could just see it. Goodbye to Greece.